Aubrey, aka Christy Sloan, was abandoned in April, 2002 at the "drop-off-no questions asked" area of the Amarillo Humane Society. At first the vet thought she was about 8 or 9 years old because of the deplorable condition of her teeth, but after checking her tattoos, determined that she was born in May, 1998. It is suspected that after washing out at the race track Aubrey was used to "run rabbits" and that is where she suffered a leg injury that was completely ignored and neglected. After Aubrey was taken into GALT's program, her injury was evaluated by several specialists and it was determined that Aubrey should not have surgery but should be treated with intra-articular injections of Adequan and be treated symptomatically for pain. She takes supplements for her joints. 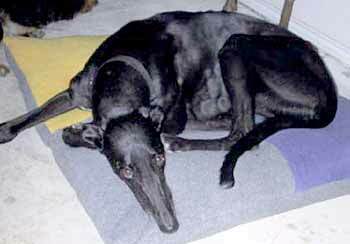 On December 18, 2002, Aubrey was adopted into a home with a small dog and Huston, another GALT greyhound. Because of a mishap with the elderly small dog, her owner thought it best that she find another home. At almost 5 years old, Aubrey is ready for a *real* forever home. Aubrey will do best in a home without children but with another greyhound or larger dog. Her forever home should also be a quiet home where her exercise will be restricted, and with someone who will be willing to continue to treat her joint problems. Look at those eyes and you can tell that all Aubrey wants is some love and affection. Aubrey is adjusting well to her former foster home. She remains a very sweet natured, shy girl with a great temperament. She loves to be petted and scratched and wants to be in the same room with her "human" companions at all times. She loves riding in the car and wants to go everywhere we go. When we return home, she greets us with wags and kisses and a slight air of contempt that she was not invited along for the ride. She is somewhat timid and looks to her human counterparts for approval and positive reinforcement. She is very eager to please, and is eager to 'fit in' with her environment. She gets along with her 6 cat/kitten companions and seems very ambivalent towards cats. We think she actually likes being around them. She is quiet by nature but does have quite a quick wit and sense of humor when she wants attention or just wants to play. She will do well in a quiet home with no children as she is more comfortable in a somewhat serene environment and can be insecure and frightened around loud noise or lots of commotion.